My dad was a many things. He was a farmer, a teacher, a great friend, a wonderful dad. He was also a collector. 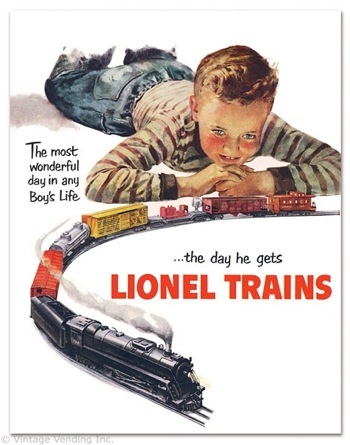 Specifically, his hobby was to collect farm toys (primarily Ford tractors) and post-World War 2 Lionel model trains. Some might tell you – and my mom might agree with them – that my dad’s collections were a bit much. It was a joke in our family that my dad always had to have a few emergency $100 bills so that if he found a great deal at a train show he could take advantage of it. He had so many farm toys and model trains that he and my mom actually built space in their house a few years back specifically to showcase them. Sadly, as sometimes happens when you take on projects like this late in life, he didn’t get to enjoy having this space for very long before he died. Growing up in a house with so many collections, particularly collections that 1) were mostly of the “boy toy” variety and 2) sometimes seemed to overtake the house in a way made me wonder if there was really room for me, I actually developed an aversion to collecting things. I feel best when I have a less cluttered, more organized home environment, and my experience with my dad’s collections, as well as living in a too-small house with five people that had all their assorted trappings of life and in some cases, their own collections, made me pretty much opt out of Collecting Things For The Sake Of Collecting Things. I used to be much more vehement in my insistence that I am not a collector. I have some of my grandma’s old salt-and-pepper shaker collection, but they aren’t displayed right now and I’ve debated passing some of them on to my niece Kendra so she can have some heirlooms from her great-grandma. I also haven’t added to the salt and pepper shaker stash at all, which made me much more comfortable in continuing to assert that No Really, I’m Not A Collector. But the recently, I’ve come to realize that I actually am a collector – a serious one. What do I collect? People. Specifically, I collect Awesome People. My friend Olivia likes to say that she is only friends with Awesome People, and I have decided to latch onto that for 2 reasons. First, it makes me feel good because if she is following her own rules, this means that someone that I have tons of respect for considers me to be Awesome. More importantly, her status as a fellow Collector Of Awesome People helps me curate my own collection. It’s a little like having my own personal version of Leigh and Leslie Keno from Antiques Roadshow in my life to help me identify Awesome People, add them to my collection, and take care of things so that I can keep my relationships in Mint or Near Mint condition. My collection of Awesome People is amazing for a couple of reasons. First, the individuals in the collection are each fantastic in their own right. I wrote about one of my Awesome People back a few months ago in the post On James, which shows just one exquisite example of one of my Awesome People. Second, the collection as a whole is fantastic. I’ve got people I collected in elementary school who mean the world to me, and people who I met at my current job which I’ve only held for 7 months – and everything in between. I’ve got people who are my parents’ age or even a little older who treat me like a favorite niece, and I’ve got one special little friend who is just 6.5 years old. I’ve got friends who are Christian, atheist, Hindi, Muslim, and everything in between. I’ve got friends all over the political spectrum. I’ve got gay friends, straight friends, and bi-sexual friends. I’ve got friends who are marathoners, friends who play CrossFit, and friends who haven’t been off their couch in months. But every single one of them is Awesome in some way – which I feel reflects positively on both them AND me. After all, the most important part of the human experience is figuring out how to love and appreciate people – not just people who are like us, but also people who are not like us. Doing so helps us understand the world around us more, and be more empathetic in general – to love better. One of the best things about collecting Awesome People is that, unlike collecting things, an Awesome Person can belong in more than one collection. Someone can be in both my Awesome People Collection and your Awesome People Collection, in many cases for different reasons, and nobody loses out – we all benefit from sharing the Awesomeness. For this reason, I’m looking forward to sharing some stories about people in my Awesome People Collection from time to time here on my blog. Because really, is there anything more important to talk about than how our lives have been impacted by the people in our lives? In the meantime, think about your own collection of Awesome People. And if you reflect on it and figure out that you don’t have as many as you like just remember – Awesome People are always up for connecting with other Awesome People…..so just be your awesome self and your collection will grow.